"After all my own researches, I cannot authenticate the history of one of our finest specimens of sacred architecture. It is the old church of Banagher. This is built of cut freestone, in a good and even an elegant style. Some modern characters, engraved on the west door, mention the foundation of the church as having been in 474, or thereabouts, but this is not likely. Beside it stands the monastery, the only one in the county which still remains. It is entire, except the roof. The door is several feet from the ground, and the building nearly square, it appears that the stairs have been built of stone. The tradition is, that O Herey, a saint, was the founder and that he used to show himself occasionally from this elevated threshold. "The tomb of this saint is in the church-yard. It is nine feet in breadth. The sand adjacent to it is reckoned sacred. In any horse-race, to this day, whoever can throw the Banagher sand on the rider as he passes, ensures success to the horse." That this church is, as Mr. Sampson supposed, of very great antiquity, will be sufficiently obvious to the architectural antiquary, from the peculiarities of its style of design and masonry--which, though common in our ecclesiastical remains, erected previous to the seventh century, are not to be met with elsewhere in the British Islands, or even on the western continent of Europe, in any Christian edifices. 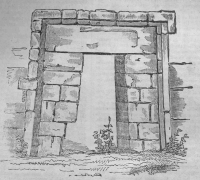 In the massive, but regular masonry of its walls, we find an example of that style of building, usually called Etruscan; while its doorway, with architrave and inclined sides, is equally characteristic of the old Pelasgic form of architectural entrance. It was before a doorway of this kind, in one of the seven churches at Glandalough, that Sir Walter Scott, with all the enthusiasm of a true antiquary, remained for more than half an hour, absorbed, apparently, in wonder and admiration, and regardless of the magnificence and beauty of the surrounding scenery. The history of these interesting remains is, as Mr. Sampson observes, involved in much obscurity, but not to the extent which he imagined; and we think we shall be able to show that their foundation may be referred, with nearly historic certainty, to the period of the apostle of Ireland's sojourn in this district, as the tradition of the place avers; and the date on the doorway, though subsequently inscribed, indicates. In the Tripartite life of St. Patrick, originally written in the seventh century, we are informed that the venerable apostle, having crossed the Foyle, sojourned in the neighbourhood of the Faughan river for seven weeks, during which time he laid the foundation of seven churches of which the names are given: viz. "Venit inde ad Dagart in agro Mag-Dula: et per septem hebdomadas circa flumen Foch Muine, (Faughan hodie) regionesque; adjacentes moram contraxit. Et inerea jecit fundamenta seetem Ecclesiarum quae Domnach-Senchua, Domnach-Daire, Domnach-Seinlis, Domnach-Moinchluana, Domnach-Catha, et Boith Domnach, nuncupatur." Tr. Th. p. 145. 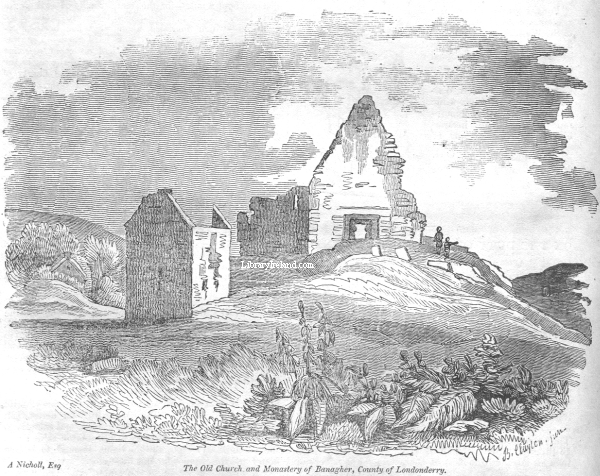 These churches, Colgan adds in a note, have been either destroyed through the injuries of time, or at least, their original names have been lost and changed into others; the church of Both-domnagh, now Badoney, situated in the valley of Gleann-aicle, being the only one which retains its original appellation, Doctor Lanigan, indeed, who not unfrequently makes an unnecessary display of critical scepticism, asserts that we are not bound to believe in this statement, as, if such churches had been really erected by St. Patrick, they would have been held in high estimation. (Ecc. Hist. vol I. pp. 263, 264). But the accuracy of an ancient historian, which is corroborated by Tirechan, an undoubted writer of the seventh century, and other testimonies, is not to be rejected on such insufficient evidence. These churches, situated in a wild and thinly inhabited district--its ancient inhabitants conquered, and in a great part dispersed--might exist, and be held in estimation by the survivors and the tradition of their origin still remain, though unknown to Doctor Lanigan, or even to Colgan himself, who resided, and compiled his work in a foreign land. And from the exquisitely finished map of Derry, recently published by the Ordnance Survey, as well as Mr. Sampson's statistical account, it appears that there are several ruins of churches contiguous to the Faughan river, which, in their style of architecture, indicate a most remote and coeval erection; and that the origin of most of those ruins, is still traditionally referred to St. Patrick. Of these churches, the ancient names are indeed now forgotten--even the church of Boith-Domnach, which retained its ancient appellation in Colgan's time, being now lost, and its situation only to be guessed at. One of these ruins is situated in Faughan vale--a second near Enoch-lough, about three miles from Derry--a third at Glen Dermot, about two miles from the same city, and which there is little doubt is the ancient Domnach-dula, or Domnach-mor, which Colgan states to be so situated--a fourth at Strad-bally-arran, which according to Mr. Sampson, the country people report to have been the second which St. Patrick founded in Derry; and lastly, the church of Banagher. It will be asked, whether we assert the antiquity of stone churches in Ireland, in despite of the assertions of Ledwich and others, that there were none such previous to the Danish irruption? Most certainly we do, and this on the evidence of our ancient histories, as well as those furnished by the existing ruins, which, in their style of building, indicate an earlier age than any churches of the kind to be met with elsewhere. Our limits will not permit us to enter on these evidences now; but we shall have many opportunities of proving this to the satisfaction of our readers, in our notices of other churches of this age, of which we have selected the church of Banagher as the first.